The Jacksonville Jaguars stunned a lot of people when the news broke that they extended the contract of quarterback Blake Bortles. After all, only one day prior to this news, there were multiple reports that Jacksonville was actually looking at landing a free agent quarterback, instead. Now the Jags are fully engaged to Bortles, at least for the time being. Though, now that details of the new deal have emerged, the team clearly made a smart move that leaves the door open for future discussions about this all-important position. Here’s how the Blake Bortles contract breaks down. He was scheduled to make $19 million guaranteed after Jacksonville picked up his fifth-year option from his rookie deal. Now, he’ll make $20 million guaranteed in 2018. But here’s the great part: The Jags have him for three more years, and only $26.5 million is guaranteed. 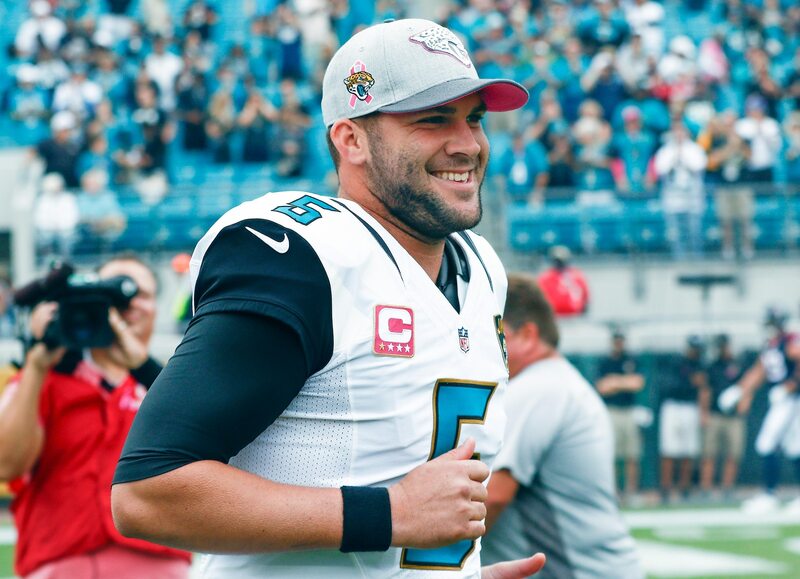 The Jaguars were scheduled to pay Blake Bortles $19M guaranteed for one year; are now paying him $26.5M guaranteed for three years (if they want him that long). Low risk move indeed. Essentially, they locked him up for three more years while also keeping their options open — the Jags could cut him after 2018 and be on the hook for just $6.5 million. So basically, the Jags can pay $6.5 million to bail from the Bortles deal after one year. If Bortles improves, deal becomes a bargain. When you consider the incredible amount of guaranteed money quarterbacks are reeling in on new deals (look at the Jimmy Garoppolo deal as an example), Jacksonville signing Bortles to this extension was a stroke of genius. It’s also important to remember that Bortles is still just 25 years old, that he’s coming off a very solid season and played his best during his first NFL postseason experience. Blake Bortles might have legitimately turned the corner last year. His team was darn close to making it to the AFC Championship Game, and the Jags didn’t lose to the New England Patriots because he played poorly. Bortles actually had the kind of playoff run that typically results in a huge financial windfall. But rather than reel in a truckload of money, the young quarterback is going to be a roaring bargain for his team, which now has more cap flexibility going forward as a result.